It was a hard winter for water lovers in Hendricks County. One of the best indoor places to swim, Planfield Parks and Recreation&apos;s indoor section of Splash Island, was closed for many months to take care of roof repairs. However, the indoor aquatic park is back open, and I can say with authority, it&apos;s an awesome place for families to enjoy. 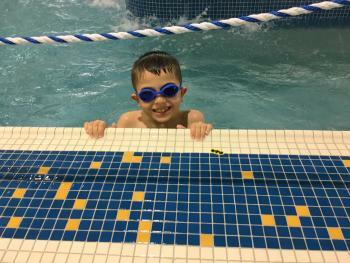 Located inside the Richard A. Carlucci Recreation & Aquatic Center, 651 Vestal Road, Plainfield, the first thing I noticed as a parent about the indoor waterpark was the clean, large changing areas that made it easy for my two boys and I to get ready for the pool. The next thing that struck me was how warm it is inside the pool area -- in a good way! It feels like the perfect summer day, and the water is just the right temperature as well. My oldest son is a strong swimmer who loves the water; my younger son can&apos;t swim on his own and doesn&apos;t like to get his face wet. The zero-depth entry pool made it easy for all of us to enjoy the water together. My older son could swim around and play, while my younger son enjoyed the children&apos;s play area that included a kiddie waterslide without fear. As a parent, I felt safe seeing the multiple lifeguards on duty and the first aid station close by. 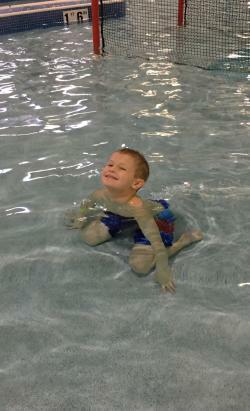 Older swimmers and adults can enjoy the indoor aquatic area, too! There&apos;s a special area designated for lap swimming, and a "big kid" waterslide that thrill seekers can enjoy. Need a life vest, pool noodle, or other pool supplies? You&apos;ll find them all on the pool deck waiting for you! If you can&apos;t wait for summer to take a swim, I highly recommend heading to Plainfield&apos;s Splash Island Indoor Aquatic Center! Check the schedule! There are blocked out times for open swim, and other times when the pool is open only for classes or lap swim. The pool schedule can be found online. Check the pricing! Plainfield residents get discounted admission, as do those with a park membership. Children under 8 are expected to be within arms length of an adult at all times. Inflatable objects like rafts are not allowed in the pool. Finally, admission into the indoor waterpark also provides you access to everything inside the Richard A. Carlucci Recreation & Aquatic Center, which includes basketball courts, ping pong tables, a concession area and a dry children&apos;s play area with fun, climbing tubes.